It’s been my good fortune and pleasure to cook in an Idema kitchen for the past nine years. I’m very happy with the kitchen and over the years the kitchen and I have certainly as if become one. With Idema I’d like to highlight the convenience and professionalism in getting things done. And not only in terms of getting from an idea to its realization. It was only last year that I received a fun surprise. Namely, a picture of me at work in my kitchen was published in a magazine. Some time before the picture was published, a handle had broken on a kitchen cabinet and I didn’t have the time to replace it. The capable staff at Idema noticed the photo and called me at once – the handle was replaced in a matter of days. Unbelievably nice! Thank you very much. 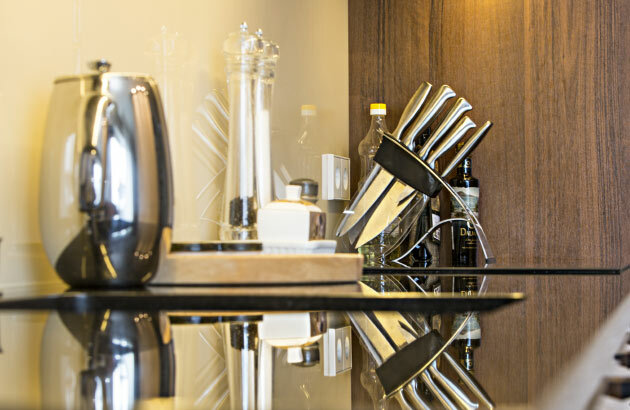 You advised me and assisted me super well and I will certainly recommend IDEMA kitchens to my friends as well! An hour the kitchen he measured, sigh. And with it, indeed, Sir Argo. 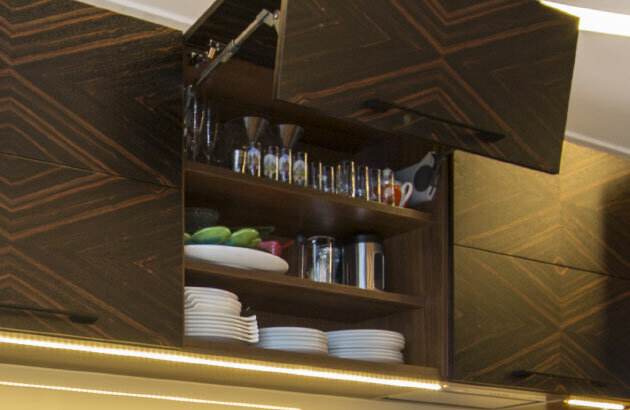 Cabinets on top, below - oh, what a brawl. So the furniture might flourish. We’d like to thank you for being so helpful and giving us such good advice while planning our kitchen! I’m more than happy with the outcome. Installation work was done in a very pleasant and skillful manner and the assisting team (the people that carried the kitchen materials up and later removed the redundant packaging) was very polite. A big thanks to them as well! Many thanks for an infinitely pretty kitchen. You managed to give us our dream kitchen. Thank you again and the design gets 100 on a 10-point scale! Thank you for your help in preparing and improving the design plan; we only have positive emotions regarding you and your company’s work as a whole! We’re currently still waiting for some missing shelves and will then install the socle. Please find attached pictures of our current situation: we’ve yet to select the tiles for the backsplash and we thought you might be able to help us with choosing the color. You (as a designer) might have some interesting ideas and perhaps we can execute such ideas? 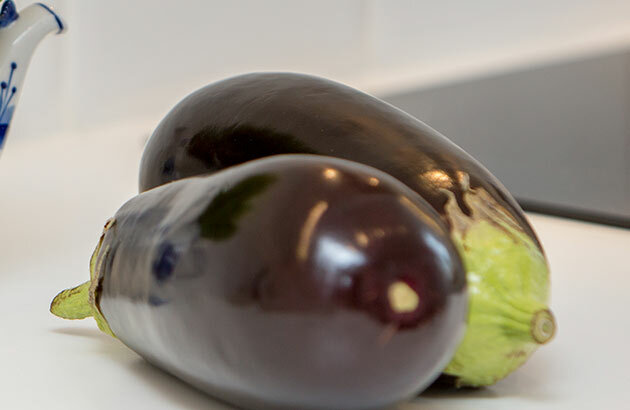 You had our design plan in 3D format – perhaps using the program, you’ll have a better idea of which color would suit the backsplash best (dark or light), and perhaps you can also see the texture (fine or coarse, three-dimensional)? Of course, if you have the time and opportunity. Thank you very much and have a nice day! We’re quite an average family of two adults and four kids; in 2012, we did something as extraordinary as to order our kitchen from Estonia while actually living in Sweden. 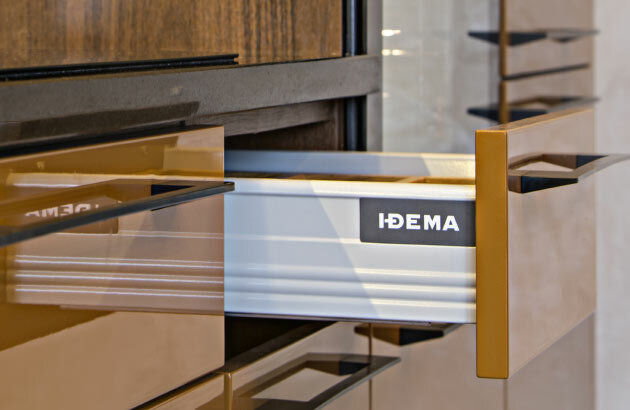 Today, we are proud owners and users of an IDEMA kitchen. We think we made an excellent choice and are happy to share our experience with you. 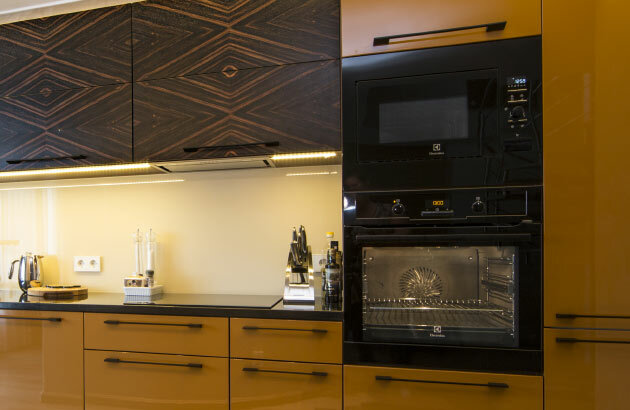 We contacted Idema Kitchens in February 2012 and visited their kitchen showroom in Tallinn. 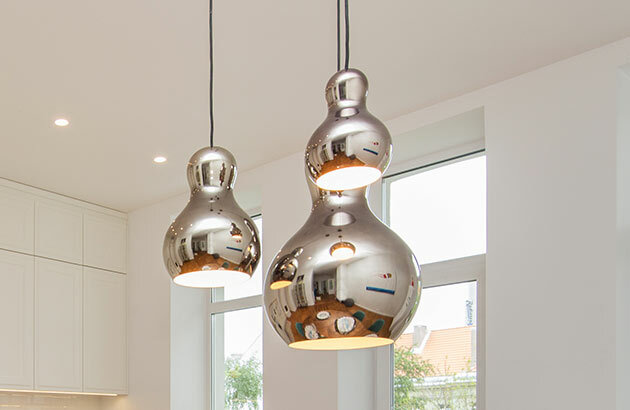 Before that, we’d spent a year looking at kitchens with various Scandinavian suppliers, yet visiting the Idema showroom we realized that it was their kitchens that had the material quality we wanted as well as numerous additional functions. Today we have a modern whitewashed oak kitchen with Siemens appliances, featuring white composite stone tiles, in-sink garbage disposal, inbuilt lighting and bi-fold cabinet lift doors – all this is at once beautiful and functional. In addition to being very satisfied with the quality and price, we also received excellent service. The designer remained most professional during the entire lengthy design phase that extended across a number of months due to us forever changing our minds. 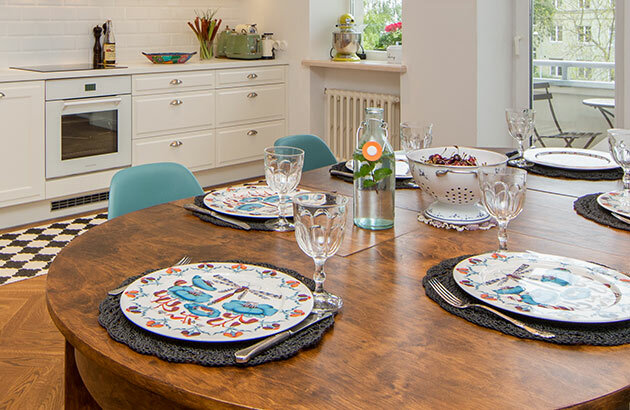 As we live in an old house built in the 1950s, it was not easy to create a suitable solution for the kitchen and the designer made many suggestions before everything was finally determined. Another positive experience came from the impeccable installation service – early one September morning a white van arrived with two friendly installers that installed the entire kitchen quickly and professionally in just a day and a half! Larger kitchen parts had been pre-assembled in the factory and this made installation notably easier. 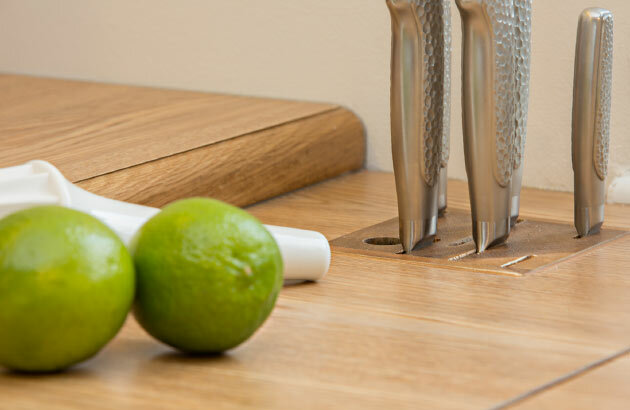 In conclusion we’d like to say that our Idema kitchen has proved a truly fortunate choice and we’re happy to recommend the company to others! Your entire staff was most professional. We were impressed with the quick and high quality work of the installer. Furthermore, the installer proposed additional technical solutions on site proceeding from the peculiarities of the space so it was obvious that this professional takes his work to heart. I cannot but stress that the clean-up team was awesome – we did not have to worry about package disposal or cleaning the work area! Thus the whole experience was all-around pleasant! We’re very happy, thank you very much!